Admiring Silence was exclusively written in the first person narrative, which makes it an intense read. We never get to know the name of the narrator. Who, is smuggled out of his homeland Zanzibar with a one way ticket to England. No coming back due to the post colonial political instability of his country. An emotional hard blow, if we take into account his family background and their deep-rooted tradition with rigid hierarchy. Then, he arrives at England, lonely and cold. Luckily, falls in love with Emma, an English woman. Basking in the warmth and love she provides him with, shakes the foundations of his belief. The novel is divided into three parts; in the first part he mainly narrates on how he met Emma and what he told her about himself. Which aren't entirely the truth though you won't know until you start reading the second part of the novel. That is, 20 years later when he is finally able to visit "home". New characters start popping up. I had to reread, stop for a while in order to be able to take it all in. He has been lying to Emma all these years, he couldn't bring himself to tell her the whole truth. Neither did he tell his people about his relationship with her and their 17 year old daughter together. That is an interesting plot on behalf of the author. I would have liked to love the narrator, however he seems to always be afraid of everything even when apparently there was nothing to be afraid of. He is not the type that lives life by holding the bull by the horns. He tiptoes around instead of walking with confident. He thinks a lot and reluctantly or never carries out his actions. I Know, his past was difficult. His family background is not one to be highly proud of. But again, you cannot control other people's actions neither can you blame yourself for their decisions. It goes without saying that to read Admiring Silence is an amazing experience. 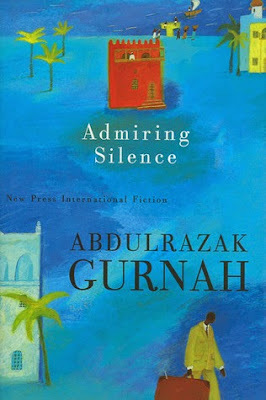 Abdulrazak Gurnah is now one of my favourite writers. He is a great novelist. An amazing writer and storyteller. I highly recommend. I have ordered another of his novel "Paradise". *I totally understand the topic Abdulrazak Gurnah is expounding on here, I had similar experience. After a trip with my now husband who is Catalan (Spanish) I logged on social media and wrote "Home Sweet Home". Most of my friends on social media many of them Nigerians, first, second, third cousins even those I am not sure the family link between us though I have known them since I was a child, everyone started commenting: "at last you are back", "welcome home", "how is Ogidi"? (village where I grew up)" Are you in the village"? "I am in town I will stop by". I had to reply them to tell them that my "Home Sweet Home" is the sunny apartment I share with my now husband in Barcelona. After spending nights in hotel rooms out of the country, it just feels good to be home again with him. Just us alone. I cannot bring myself to call somewhere else home other than where I live now with him. As an expatriate we go through a metamorphosis associated with our different circumstances that makes us start experiencing the world differently. It makes one become an entirely different person that those left behind sometimes will never get to understand. Life goes on, anyway.